Combined 90 pound weight Loss and Down 50 inches! After many years living on the mainland, we decided to move back home three years ago. The main reason was to bring our son, Declan, home to be raised close to family. As we settled in, I noticed that we were becoming more sedentary in our lifestyle and we were always surrounded by comfort food. I could see that both Brian and I had gained more weight, adding to the few extra pounds we were already carrying. The more weight we gained the worse we felt  we had no energy and we felt unhappy. We needed a change and we wanted to take back our lives for each other and our son. We wanted to be healthy for Declan! I noticed the SIF flyers and decided to join. Michelle, April and SIF instructor team were very supportive of my reintroduction to fitness. Over the course of a year my confidence level grew and I enquired about the SIF running group and was encouraged by both Michelle and Brian to join. Between the fitness classes and running I noticed that I was slimming down, my clothes started to fell loose. I was feeling good and proud of my activity level. While I was doing this, Brian was busy at home riding the stationary bike. We felt active but we needed something else to kick start our weight loss journey. Then, Transformation Challenge was introduced. 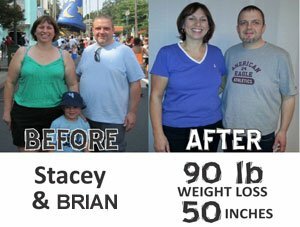 This program sounded like the perfect starting point to a healthier life and, more importantly, something that Brian could do to shake up his exercise routine and point counting regime. It was difficult for Brian to join a female dominated program but he did it and persevered. The results have been amazing. We are both more active in our lives than we have ever been and loving it. In addition to running and TC, we have expanded into yoga, Pound, HIIT, MELT and 20/20/20. We have more energy than ever and feel better about ourselves. All the aches and pains from arthritis and carrying around the extra weight have been replaced by workout pains. Throughout our lives weve struggled with our weight. We tried many fad diets, were sick of counting points and not eating carbs. Needless to say, our weight never stayed off. Sister in Fitness has, finally, taught us that we had to change our life style and not just suffer through a fad diet. We now feel like we are on a lifelong journey. Since September 2013 we have lost almost 90 pounds and over 50 inches combined and we feel that its finally going to stay off. Declan now wants to go running with me and he loves to run the Manuals River trail. He is interested in learning to exercise with Daddy. Our motivation was to get healthy for our little boy and to ensure that he has a good foundation for his own growth. We want to be there for him and support him for as long as were able. He is our motivation to continue this healthy journey. Thank you SIF for welcoming us into the family and supporting us. Your enthusiasm, personal touch and genuine concern for each member do make the journey worthwhile. The support and motivation shown by Michelle, April and team is making our journey physically harder but mentally easier.